Each house is made to order, there is a 7 to 10 day lead time. To order please email me at michaelswoodcraft@yahoo.com along with the quantity and your ship to address. I will email you back with order details and payment options. * Not including roof tin, as the tin is extended pass the wood for rain purposes to keep the birdhouse dry. Tin roof extends approximately 1″ on each side. Get your Bluebird house today and you can have bluebird eggs in your house! Hi Michael – Thanks for your comment on my blog. How do your bluebird houses open for monitoring and cleaning? On the right side of the house there is a door that opens up. The entire side of the house opens so that it makes it easy for fall cleaning. They’re really very cute, Michael. 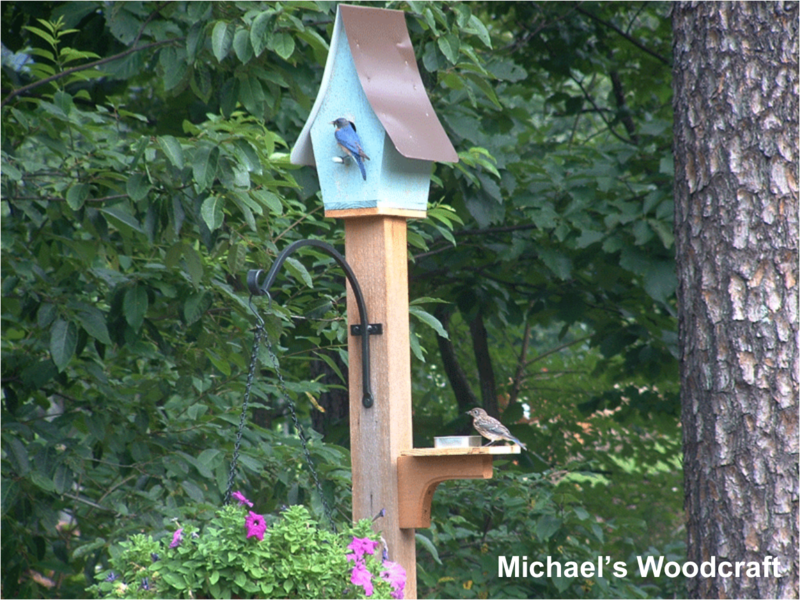 We also like bird houses and nesting boxes and my husband made a few lovely ones. thank you, Annette The bluebirds are beautiful birds! Just an idea – your birdhouses are pretty cool. You might make some additional money by making plans and putting them on Sawtooth Ideas. I think they sell well there. HI Jeff, thank you, that is a good idea. Damn! I wish I had bluebirds where I live! These are beautiful! Hi Mimi, the bluebirds are very beautiful! Where do you live? I am so glad you visited my site and taking time to comment. I just browsed over to your site too and I am glad I did, great recipes! I love to cook too and it’s always nice to have another site to visit for recipes! 🙂 I hope you will visit again soon. What a lovely breath of spring, Michael. Hugs!